DETROIT, March 25, 2019 /PRNewswire/ -- College students from across the country are heading to Detroit this Friday, March 29 through Sunday, March 31 for a chance to make their entrepreneurial dreams come to life. Detroit-based Ally Financial Inc. has teamed up with fellow Motor City native, entertainer and entrepreneur Sean 'Big Sean' Anderson and the Thurgood Marshall College Fund (TMCF) to create Moguls in the Making - an innovative program aimed at preparing students from Historically Black Colleges and Universities (HBCUs) to become future entrepreneurs and members of the business community. Out of over 500 applicants, TMCF selected 50 students from 10 HBCUs to compete in the weekend-long challenge. In addition to hearing from Ally CEO Jeff Brown, the students will participate in mentoring sessions, hear from local business leaders, and attend financial education classes. For the competition, working in teams of five, they will develop business plans that include solutions to economic issues facing various industries in Detroit. The teams will pitch their solutions to a panel of judges including Anderson, entertainer and founder of The Sean Anderson Foundation; Andrea Brimmer, Ally chief marketing and public relations officer; Anand Talwar, deposit and consumer strategy executive; Tommey Walker, principal of Detroit vs. Everybody; and George Spencer, executive vice president of business development, Innovation and Entrepreneurship at the Thurgood Marshall College Fund. "By bringing Moguls in the Making to Detroit, Ally Financial is able to showcase our home city of Detroit while investing in the future of aspiring business leaders to help them realize their full potential," said Brimmer. "As a company committed to economic mobility and diversity and inclusion, we're happy to work with likeminded organizations as well as other notable Detroit natives to bring this initiative to life." 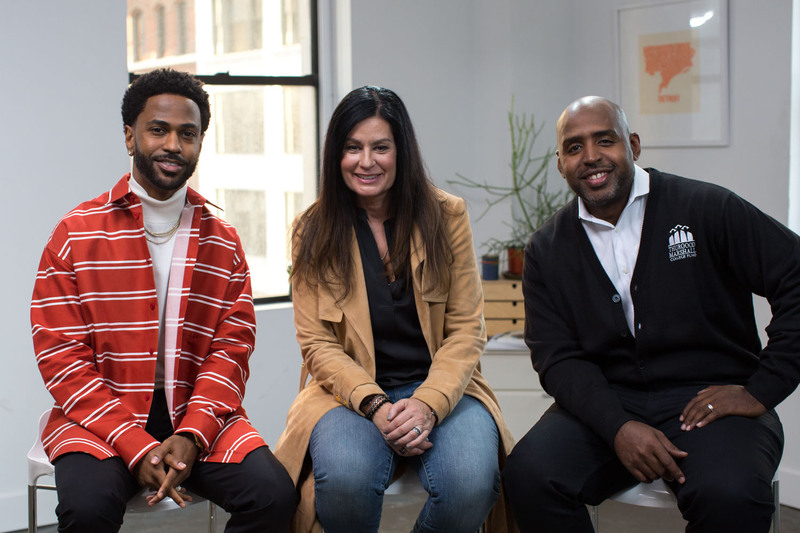 Created to give young entrepreneurs a platform and encouragement to develop much-needed business skills, the Moguls in the Making program will include mentoring sessions and fireside chats along with the chance to meet Detroit native Anderson. "It's all about inspiring the youth - providing them with opportunities and knowledge to build their futures. I'm excited to see what they come up with," said Big Sean, who has partnered with Ally for the Moguls program. The ten schools represented by student teams include Alabama A&M University, Elizabeth City State University, Florida A&M University, Howard University, Jackson State University, Morgan State University, Norfolk State University, Virginia State University, Tennessee State University and North Carolina A&T State University. In addition to key learnings from the program, the winning group of students will walk away with Ally internships, a $5,000 scholarship for each team member and Macbook Air computers. "TMCF is excited to team up with Ally and the Sean Anderson Foundation for the Moguls in the Making Competition. Detroit's rich history of entrepreneurial endeavors makes the Motor City the perfect place to host the event," said Spencer. "We are proud this opportunity will benefit both the City of Detroit and 50 of our nation's brightest students from across 10 publicly-supported HBCUs." Ally Financial Inc. (NYSE: ALLY) is a leading digital financial services company with assets of $178.9 billion as of December 31, 2018. As a client-centric company with passionate customer service and innovative financial solutions, Ally is relentlessly focused on "Doing it Right" and being a trusted financial partner for its consumer, commercial, and corporate customers. Ally's award-winning online bank (Ally Bank, Member FDIC and Equal Housing Lender) offers mortgage-lending services and a variety of deposit and other banking products, including CDs, online savings, money market and checking accounts, and IRA products. Ally also promotes the Ally CashBack Credit Card. Additionally, Ally offers securities brokerage and investment advisory services through Ally Invest. Ally remains one of the largest full-service auto finance operations in the country with a complementary auto-focused insurance business, which together serve approximately 18,000 dealer customers and millions of auto consumers. Ally's robust corporate finance business offers capital for equity sponsors and middle-market companies. Established in 1987, the Thurgood Marshall College Fund (TMCF) is the nation's largest organization exclusively representing the Black College Community. TMCF member-schools include the publicly-supported Historically Black Colleges and Universities and Predominantly Black Institutions, enrolling nearly 80% of all students attending black colleges and universities. Through scholarships, capacity building and research initiatives, innovative programs and strategic partnerships, TMCF is a vital resource in the K-12 and higher education space. The organization is also the source of top employers seeking top talent for competitive internships and good jobs. TMCF is a 501(c)(3) tax-exempt, charitable organization. For more information about TMCF, visit: www.tmcf.org. The mission of the Sean Anderson Foundation is to assist in the education, health, safety and well-being of primary through college aged youth in underserved communities across the country. Sean is a living example of what can be accomplished through focus, determination and hard work. He strives to serve as an instrument of encouragement for us to help support ourselves and to support one another. The Sean Anderson Foundation's signature program is "Mogul Prep," a digital and live event curriculum that focuses on developing entrepreneurial skills, preparing students for college and/or the work force, and ultimately for a successful life. In addition, the Foundation partners with a number of existing charitable programs whose objectives are consistent with the objectives of the Foundation.